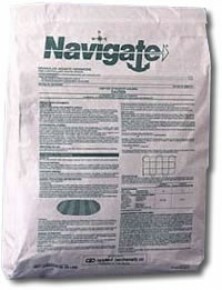 Navigate is an aquatic granular formulation of 2, 4-D. It is remarkably effective on submersed Northern and Eurasian Water milfoil, and Stargrass. It is equally effective on Water lilies and Water Shield. Navigate will translocate into the root systems resulting in long term control. Two applications may be required to achieve long term results on Water Lillies. Use a hand scoop or spreader for easy application. No Fishing Restriction. We like Naviagte for Lily control. It gives you long lasting control and can offer control of other submersed plants at the same time. Sample 100ft x 100ft Lakeshore Lot (.23 Acre) (4' Average Depth) Submerged weed control. *Amount of Navigate required : 25 to 50 Lbs. Water Use Restrictions: 24 Hours Swimming, None on Fishing. For Turf Irrigation - See Label. The Navigate Granular Product Label is available for download in pdf.